The cubicle's cruel evolution Jump to media player In his book Cubed: A Secret History of the Workplace, author Nikil Saval chronicles the evolution of the workspace where 60% of Americans spend their days. The office cubicle is a source of frustration for many workers, who spend long hours at cramped desks dreaming of the executive's corner office. 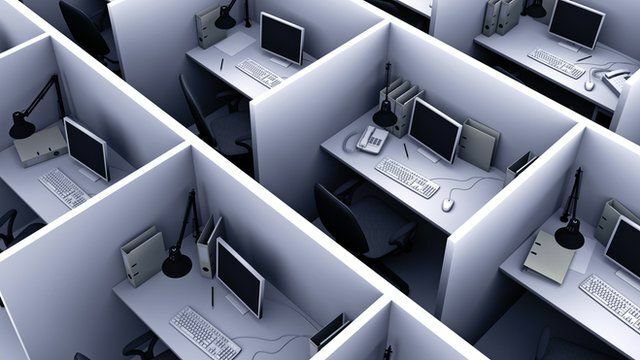 The cubicle has become so ubiquitous that we rarely give it a second thought, but it was actually invented in the 1960s to give workers more privacy and autonomy. In his book Cubed: A Secret History of the Workplace, author Nikil Saval chronicles the evolution of a place where 60% of Americans now spend their days. He spoke to the BBC about the transformation of corporate culture - and how American executives hijacked a concept designed to liberate workers.